Came in with friends on Saturday. I actually enjoyed it contrary to some other reviews. I am very much a pubber and this suited me fine. Music was being played but not to the stupidly loud point where we couldnt hear each other talking. The beer wasnt stupidly priced and I found the patrons friendly too. I would definately go back. This place is now called the Library and during my week night visit I felt like I had actually walked into one. This is a place for people who don�t do pubs. My change was returned on a tray and it was dark and depressing. I left whilst I still had some energy left, never to return. 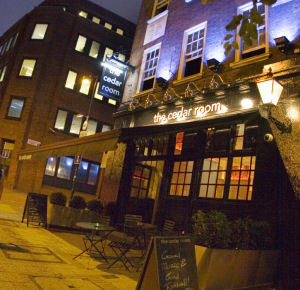 Very enjoyable evening spent in there this week, was quite busy tho and they could do with a bit more seating. Other than that it was all good. Heard about this one from a friend, so decided to take my girlfriend there the other day, and was definately not dissapointed! Found out that it was 2 for 1 on cocktails, which we both took full advantage of! My girlfriend chose an ammaretto sour and I went for the caipirinha which both tasted great. Nice to be in an independant bar rather than the soulless chain bars found on upper st!